2004 was a milestone for political campaigning in Europe. 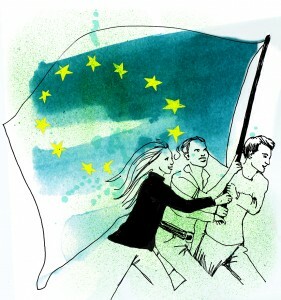 For the first time in history, a party family – The Greens – had the courage to run a common Europe-wide electoral campaign for the European elections, with the same posters, the same claim and the same messages from Helsinki to Lisbon, from Dublin to Vienna. This project of the European Green Party and its national member parties demonstrated two main points: there is already a kind of ‘European public’, and you can win elections if you overcome national borders. Nonetheless, voters and the media are still largely uninterested in the European institutions, and European issues remain some way down their list of priorities. Surveys show that the work of the European Parliament is not really on the agenda of the media. Certainly, ‘euronews’ or websites like ‘euractiv.com’ do guarantee a form of media coverage, but their target groups are people who have private or business interests in European politics. Yet, nobody will disagree that the decisions made at European level already have a considerable influence on our lives. But why does ‘Brussels’ still seem to be so far away from its citizens and the media? Voters want to choose between different political positions and parties. But even member state politicians do not differentiate between the work of the three European institutions (European Parliament, European Commission, Council). And most national politicians and journalists do not know if EU commissioner X or MEP Y is member of a liberal, green or conservative party. As a result, voters do not have the feeling that they have a real choice between several options and different political conceptions at the European level. You should invest time finding out which institution and which European party family has which positions. This can be helpful to your national campaign for two reasons. You could maybe prove that the conservative party in your country calls for a stronger control of the financial sector, but that, simultaneously, this same party prevents effective control measures being adopted in the Council of the European Union. Or perhaps you can show journalists in your country that the liberal members of your national parliament are in favour of stronger data protection rules, but that the liberal group in the European parliament is trading EU citizens’ personal data with the USA, as highlighted by the SWIFT agreement. Good sources for your research are the offices of your Green MEPs and the Green Group’s website, especially the Green/EFA vote tracker. Please choose the right examples, concentrate on them, and try to make them understandable to the broader public. Be careful to avoid European information overkill. Prepare all the necessary information in your own language. The ordinary voter is not interested in getting information in French or English if she herself speaks Hungarian. This is not only true for printed material but also for your online activities. Perhaps Green parties in other countries or the European Greens have already come up with successful and innovative ideas. Use them in your national debate. Underline that, although your party may not be the biggest in your country, it is part of a European-wide party movement with tens of thousands of party members and influence at all political levels in Europe.